The sailing vessel (s/v) Smitty is a 2001 Catalina 310. We purchased her on December 20, 2010 in Warwick, Rhode Island. Catalina Yachts introduced the 310 in 1999 and made over 300 hulls before discontinuing the model in 2008. The concept behind the 310 was to design a boat for experienced cruising couples that are looking for the amenities of a 40-foot boat in an easy to handle hull while still having plenty of room for gatherings of boat people. According to Gerry Douglas of Catalina Yachts, this is how the idea for the boat came to him. “One morning, I was rowing ashore at Catalina Island, and I kept passing all these couples in their 40s and 50s that were alone on their 40-footers. I realized that they bought larger boats than they really needed because they wanted certain features that they couldn’t find in smaller boats. They wanted a good-sized owner’s berth forward because at this age, we’re past climbing over each other to get into bed. They wanted a separate shower and ample water and power to spend time at anchor, and they only needed one comfy cabin plus another for occasional guests or grandkids. That’s how the 310 evolved.” The description of the 310 I like is 8 for cocktails, 4 for dinner and 2 for cruising. The hull is solid fiberglass, the deck is cored with plywood and the cabintop with end-grain balsa. A grid-and-beam system and a liner were then installed. Our boat is shoal draft wing keel with a draft of just under five feet. A large spade rudder keeps her very maneuverable in tight spaces. The double-spreader masthead rig supports a high aspect mainail with a Dutchman flaking system and a 135% genoa, both of which were standard equipment. The shrouds terminate on the cabintop leaving 18” wide decks for easy movement fore and aft. Four self-tailing Lewmar winches – two primaries and two on the coachroof manage the lines – all of which are led aft for easy singlehanding. Displacing only 10,700 pounds, the 310 sails well in light air. On a beam reach, she’ll do 6.0- 6.5 knots in 12-15 knots of breeze and like most cruising boats, will need to be reefed when winds exceed 17 knots. Under power, she’ll cruise at 6.3 knots at 2500 RPM with a two-blade fixed prop. The accommodations are designed primarily for a couple, with a large owner’s cabin forward. 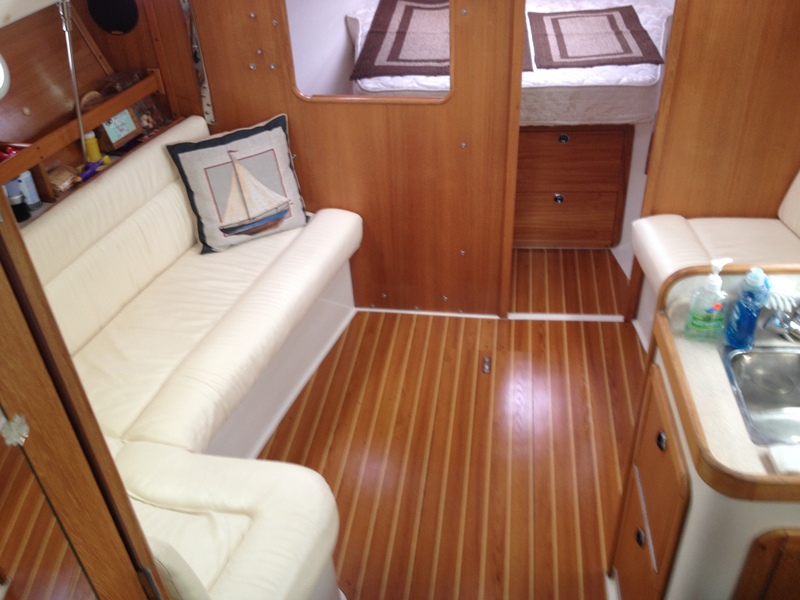 A queen size centerline berth, innerspring mattress, and large bank of drawers. Lockers are both port and starboard. The main cabin is plushly upholstered with deep comfortable seating. 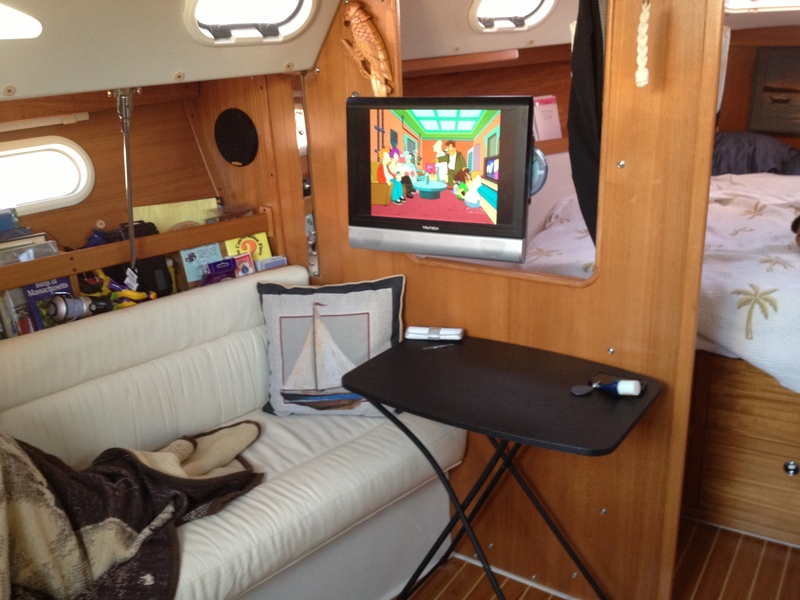 Forward is a closeable opening in the bulkhead and built-in hardware to allow for TV viewing from either cabin. Also, there is a huge double berth aft for guests. The galley has everything for memorable meals aboard: a two burner stove with oven, a top and front access refrigerator, deep stainless steel sink, lots of handy storage, and a microwave. 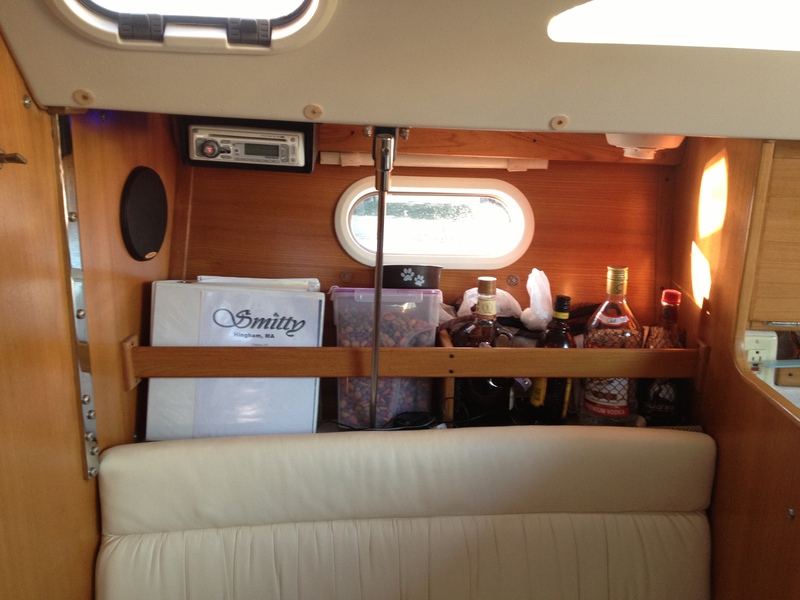 The head has a separate shower compartment and plenty of storage; all through hulls are easily accessible. Special features include a twenty gallon water heater, two 4D deep cycle batteries with an electronic battery charger, high quality fixtures, easily accessible pumps, valves, and filters, a Maxwell electric windlass and walkthrough transom with a very wide and deep boarding ladder. She looks great, Jesse. I love this page, lots of info, thanks. Hi Jesse, Thanks to your comments on SF I’m reviewing my tablet purchase…to Ipad! I note that you are counting down the days until you cast off….are you intending to venture far in your C310? Hi Alan. Thanks for reading. We plan to do what we consider coastal cruising. That’s going to be island hopping through the Caribbean and down to South America. Thanks LOADS Smitty. Great info and extremely helpful.